In view of the anniversary of Rosa Park’s 1955 Montgomery bus boycott, we bring to the attention of our readers this article originally published by Global Research in October 2010. After attending Alabama State Teachers College, the young Rosa settled in Montgomery, with her husband, Raymond Parks. The couple joined the local chapter of the NAACP and worked quietly for many years to improve the lot of African-Americans in the segregated south. The bus incident led to the formation of the Montgomery Improvement Association, led by the young pastor of the Dexter Avenue Baptist Church, Dr. Martin Luther King, Jr. The association called for a boycott of the city-owned bus company. The boycott lasted 382 days and brought Mrs. Parks, Dr. King, and their cause to the attention of the world. A Supreme Court Decision struck down the Montgomery ordinance under which Mrs. Parks had been fined, and outlawed racial segregation on public transportation. In 1957, Mrs. Parks and her husband moved to Detroit, Michigan where Mrs. Parks served on the staff of U.S. Representative John Conyers. 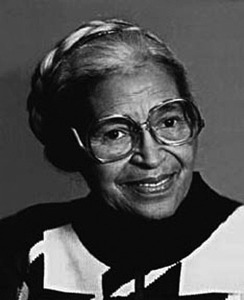 The Southern Christian Leadership Council established an annual Rosa Parks Freedom Award in her honor. After the death of her husband in 1977, Mrs. Parks founded the Rosa and Raymond Parks Institute for Self-Development. The Institute sponsors an annual summer program for teenagers called Pathways to Freedom. The young people tour the country in buses, under adult supervision, learning the history of their country and of the civil rights movement. President Clinton presented Rosa Parks with the Presidential Medal of Freedom in 1996. She received a Congressional Gold Medal in 1999. Mrs. Parks spent her last years living quietly in Detroit, where she died in 2005 at the age of 92. After her death, her casket was placed in the rotunda of the United States Capitol for two days, so the nation could pay its respects to the woman whose courage had changed the lives of so many. She is the only woman and second African American in American history to lie in state at the Capitol, an honor usually reserved for Presidents of the United States.